Born and raised in Northern England, Jules spent her time living in London, Hong Kong, Singapore, L.A. and San Francisco. 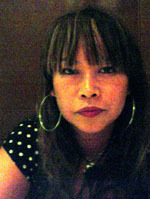 She has traveled extensively, building more than 20 years experience, as a hairdresser and instructor around the world. Jules, started Dekko Salon in San Francisco in 2002, along with 2 business partners, within 6years of opening, the trio has made Dekko one of San Francisco’s hidden gems. Dekko has won the Bay Guardian’s prestigious ‘Best of the Bay’ award, 5 years in a row, from 2004 – 2008. This award winning salon now has a staff of 15. Clients come from as far as HK and NY to have their hair done by the Dekko team. Check out my Blog! Prior to Dekko, Jules was categorized in America as an “Alien with extraordinary ability, (E1 visa)” gaining access to work in the US based solely on her work as an artist. She came to one of San Francisco’s most prestigious salons Architects and Heroes. During this time, Jules was listed in Vogue magazine in 2000 as the SF stylist to see for the best funky bob in the city. Also during this period, she brought her freelance flair into play and styled the hair for the music video for the popular band ‘Third Eye Blind’s’ song ‘Jumper’, as well as photo shoots for The Red Herring magazine working in Hollywood with one of the worlds top photographers, - Helmut Newton. Before moving to SF, Jules was based in Hong Kong, Singapore and LA. In Singapore, Jules worked with top hair companies, training stylists and teachers. While in LA she worked with the stars of one of the most successful Asian commercials of 1998 – Ericsson with Maggie Cheung and Michael Wong. In addition she worked with MTV’s ‘Most Wanted’ show around Hollywood, LA including coverage of U2’s ‘POP” concert held at the coliseum. During her tenure in Hong Kong, Jules worked mainly as a freelancer, working as stylist for MTV, Channel V and Star TV’s photo sessions and events, including the Launch of MTV in India. She styled the hair for V.J.’s (Video Jockeys) as well as highly sought after performers and groups/singers such as Take That and Chris Isaak. She also collaborated with HK Ballet and Opera productions, creating wigs for theatrical performances such as Swan Lake, Peter Pan, Cinderella and Turandot. Her published editorial work includes shoots for HK Elle, and Cosmopolitan. Jules served as an instructor in HK, Taiwan, London and Singapore. She helped establish curriculums for hairdressing schools as well as teaching courses on hair make up and total image concepts.